Cloud didn’t just hear from students who promised to turn off the lights when they left the room or use less water or recycle bottles and cans – all practices that support environmental sustainability. She heard from students who wanted to know how to incentivize environmentally friendly practices at the corporate level, or how to transition safely and effectively from non-renewable energy sources to renewable energy. In other words, she heard from students who were thinking deeply about the problems related to ensuring that Earth’s resources can sustain future generations. For example, Cloud said, Deputy Superintendent Ray Sanchez and Ossining High School Assistant Principal Chris Olson wanted to bring the students into the discussion about ways to transform the district into a sustainable one, rather than just dictating to them what would be done. “That was a brilliant idea because the students are our greatest asset. Yet, it is not what most districts do,” Cloud said. Cloud’s visit was made possible by a grant from TD Charitable Foundation. 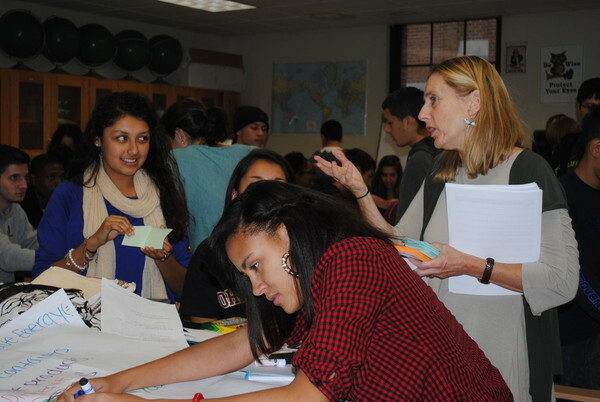 During her daylong visit, Cloud spoke to about 300 students in several classes led by teachers who have been working with the Curriculum Center at Putnam Northern Westchester BOCES to develop sustainability lessons that can be incorporated into all subject areas. She gave students an overview of what it means to be sustainable – to live well within the limits of nature – and challenged them to brainstorm about ways to make the community more sustainable. In one class, students talked about recycling more, taxing companies that do not use renewable energy, using clean diesel fuel, walking to school if possible, promoting the use of electric cars and providing economic incentives to companies that adopt environmentally-friendly practices. The Cloud Institute, founded by Cloud and based in New York City, works with school districts to cultivate new ways of thinking about the use of natural resources and the need to move society toward a sustainable model. In addition to hosting Cloud, the Ossining school district also has: created sustainable gardens at Brookside and Roosevelt Schools; created a district-wide green team; switched to green products in our facilities department; adopted a sustainability policy; and developed and piloted a sustainability curriculum that crosses Language Arts, science, math, social studies and the arts.